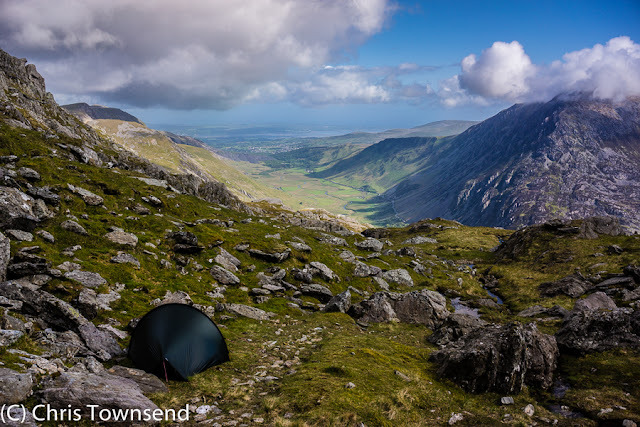 Chris Townsend Outdoors: A Wild Camp in the Glyders: corrected version - I thought I knew where I was! 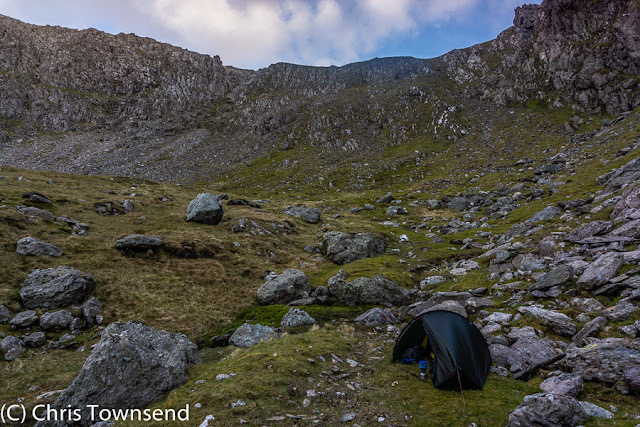 A Wild Camp in the Glyders: corrected version - I thought I knew where I was! A few days ago reader Bob Wilkins contacted me to ask if I was sure that the photo labelled 'Cwm Bochlwyd with Cwm Idwal below' was actually taken in that cwm as it looked to him as though it was taken in Cwm Cneifion. I checked the map, my memory, my notes and my photos and replied that I was sure. Bob replied, very politely, that the view could not have been taken from Cwm Bochlwyd. I checked the map more carefully and realised he was right, which wasn't surprising as he knows the area really well having spent over ten years as a member of the team at Yr Hafod, the Welsh Scout Council base at Ogwen, taking out parties of Senior/Venture scouts and their leaders for instruction and assessment. One of the things we did, wrote Bob, was to encourage close scrutiny of maps and angles. Clearly this was not something I'd been doing. I think what happened was that I simply wasn't bothered about route-finding or my location at the time and was just wandering about looking for a camp site and not paying attention to the overall terrain. Similarly the next morning I was just looking for a way onto the main Glyders ridge above, something the map was no help with so I didn't consult it. So I managed to camp in Cwm Cneifion without knowing it. As it happened this didn't matter but I will be a bit more careful with checking where I am in future (if I'd switched on my phone and checked on ViewRanger I'd have realised where I was but I didn't because I thought I knew). Here's a revised account with corrections to the photo captions and the story. Lashing rain blasting past the windows of Plas Y Brenin, driven by winds that sent white-capped waves down Llynnau Mymbyr, didn’t encourage an early start for an overnight trip into the Glyder hills. Rather it spoke of another coffee and a relaxing morning studying the maps, browsing the web and reading outdoor magazines. By lunchtime the rain had stopped. The wind hadn’t and the trees were still thrashing wildly. I ventured out for the short walk to Capel Curig and shelter and lunch in a café. Just that stroll in the wind was enough to change my plans. Heading up the long broad ridge from Capel Curig to Glyder Fach and Glyder Fawr with a high camp on the mountainside wasn’t an attractive idea in this wind. 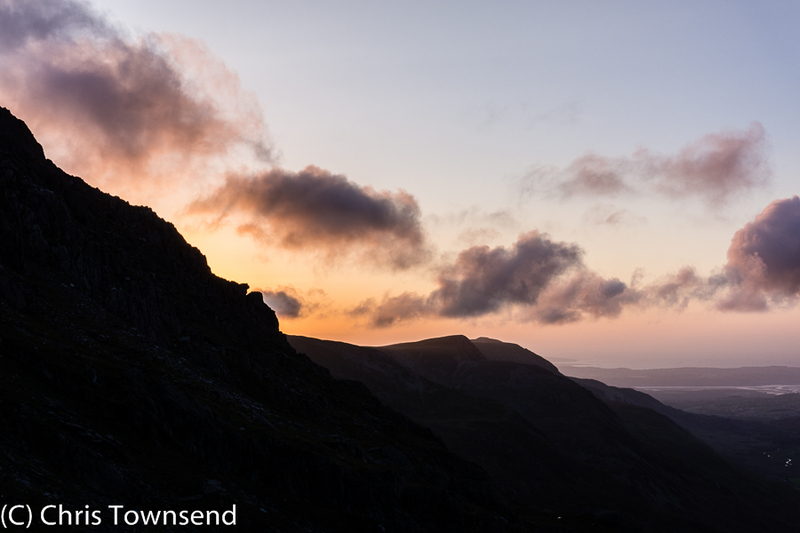 Instead I decided to stay low and walk along Nant y Benglog to Llyn Ogwen before heading into the northern cwms (or corries, bowls, cirques) of the Glyders (or, correctly, Glyderau) in search of a sheltered camp site. Battered by the wind down in the valley I quickly realised this was a sensible plan, as long I could find that sheltered site. Not that valley camp sites seemed attractive. 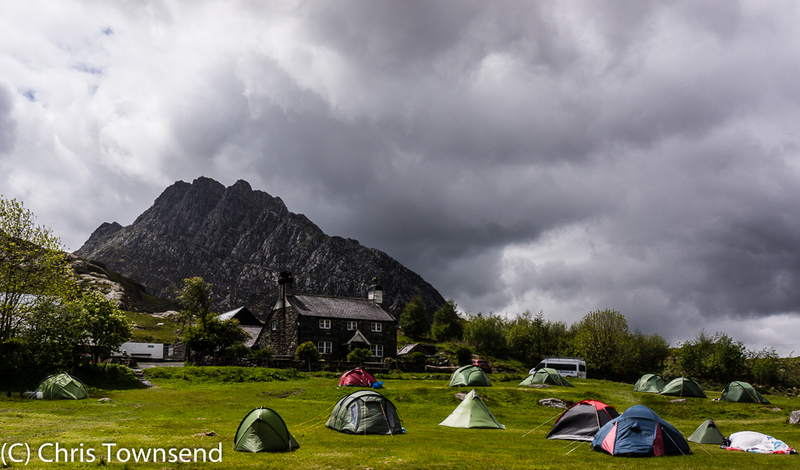 I passed the one at Gwern Gof Isaf and noted the tents shaking noisily in the wind. One had collapsed. Several looked very unstable, partly due to poor pitching, mostly due to the wind. 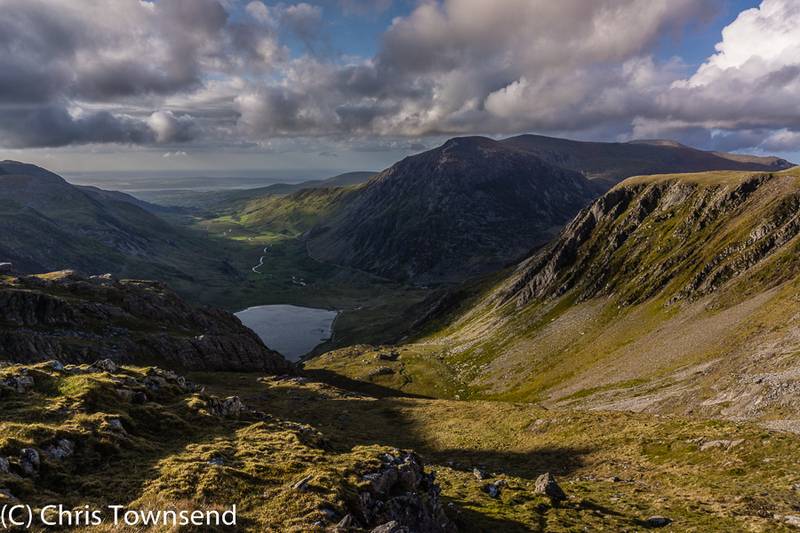 After a coffee from the stall at the foot of Llyn Ogwen I headed up to Cwm Idwal. Evening now and many people were descending. I soon had the mountains to myself. Many years had passed since I was last here but the memories of many visits – and, undoubtedly, seeing photographs of these iconic places many times – gave the scene a familiar air. On I climbed into Cwm Bochlwyd where I thought I might camp. I circled round the lake. The wind swept over me. Still too strong for comfort I thought and continued on beside the stream into the narrower confines of the upper cwm - or so I thought, this is when I must have left the stream long enough to cross into Cwm Cneifion and then follow the stream there. Everywhere flat was windswept and, mostly, also waterlogged. Eventually I found a not too bumpy, not too sloping, not too boggy and not too windy site. It would do. As evening turned to night the skies cleared though the wind still roared strongly. The temperature fell to barely above freezing, cold for June even high in the mountains. The wind woke me a few times during the night, as did the less than level ground. Morning came with a slightly less ferocious wind and a return of the clouds. Leaving my spectacularly situated but not that comfortable camp site I started exploring the broken rocky terrain above, searching for a way onto the hills above without losing any height and without getting into any difficulties. Eventually some easy scrambling and a wide gully took me onto the broad ridge roughly half way between Glyder Fawr and Glyder Fach. Despite my memories of all those past visits the starkness of the rocky terrain was still startling, the splintered rocks seeming almost unnatural and other-worldly. So many rocks twisted, contorted, standing on edge like giant stone knife blades; this is a hostile landscape. I crossed the rocks to Glyder Fawr then turned and headed for Glyder Fach past the most famous of the rock piles, the Castell y Gwynt – the Castle of the Winds –, and the equally well-known Cantilever Stone, on which people were queuing up to stand. 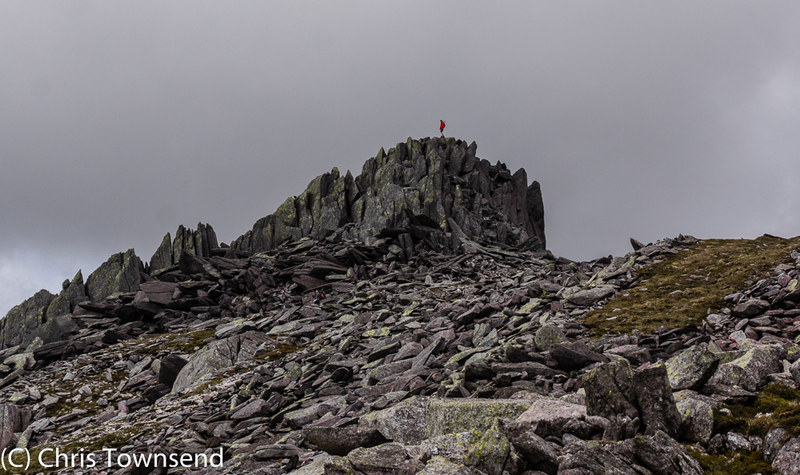 Unsurprisingly, despite the cold wind, there were many walkers on these popular summits. 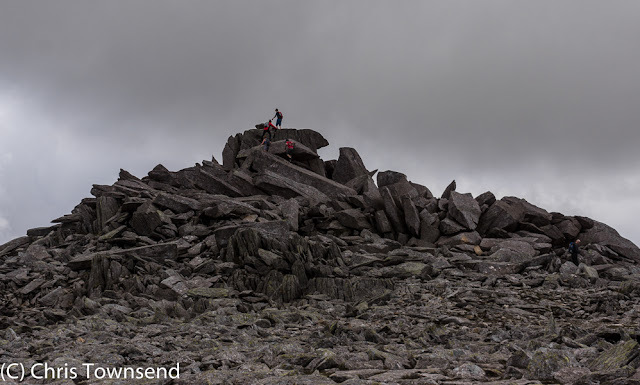 As soon as I left Glyder Fach and headed east over Y Foel Goch and Gallt yr Ogof the people vanished though, as eventually did the rocks, making for much easier walking. I left the dark clouds behind too and was soon in sunshine though whenever I looked back I could see them hanging over the higher peaks. 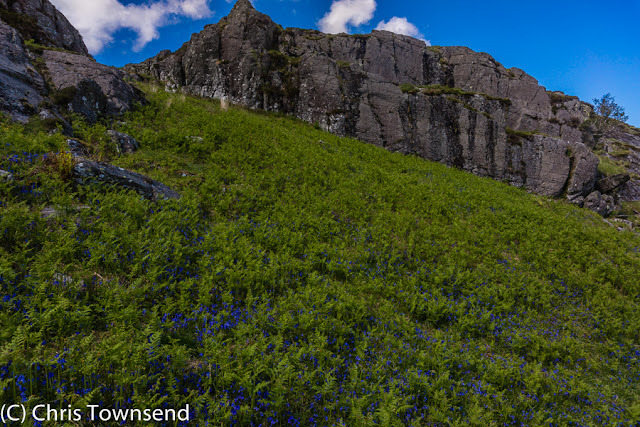 A final descent down slopes rich with bluebells and fresh bracken fronds was a complete contrast to the sterility and harshness of the rocky summits. I can remember camping at the Gwern Gof Isaf campsite more than 30 years ago as a young kid to go rock climbing on Little Tryfan with my dad. They were some amazing holidays, even if the campsites did only have a single outside toilet and that was it. Thanks for bringing back those memories. i,m with marc as in i,ve stayed at the same campsite six years ago whilst trying to do the welsh 3000,s but the weather beat us. it,s nice to revisit these places after a long time. Yes, what a great area. I could have done with a breeze though when camping at Gwern Gof Isaf years ago to keep the midges at bay. I really must get back there.